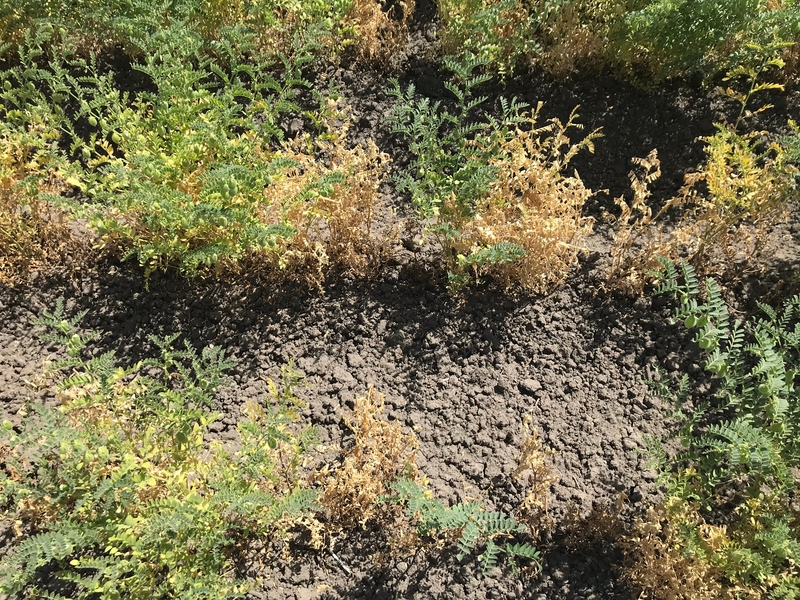 A field in Sutter County was confirmed to have charcoal rot, also known as dry root rot or ashy stem blight, which is caused by the fungus Macrophomina phaseolina. The disease generally occurs under dry soil conditions paired with high temperatures and can be especially problematic when irrigation is delayed during periods of drought stress. 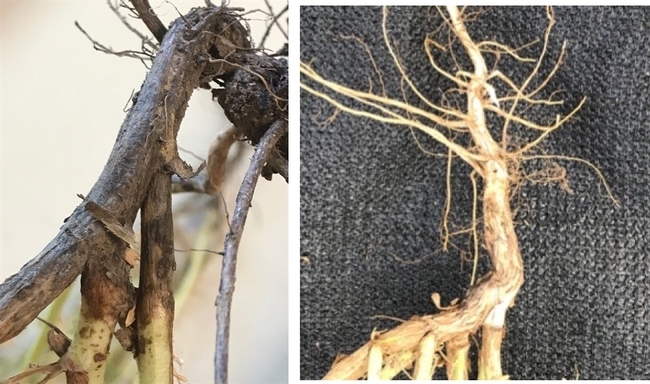 This pathogen infects the crown and stem of garbanzo plants near the soil line and produces black cankers, which are sunken with distinct margins and often contain concentric rings. The disease is usually scattered in the field and often occurs during the flowering and pod stages (although infection can occur at all growth stages). The pathogen infects the stems of seedlings at the base of the developing cotyledon near the soil line. In older plants, symptoms include stunting, leaf chlorosis, early defoliation, and ultimately plant death. A sudden drying of whole plants scattered in the field is observed. Additionally, a “charcoal dust” can appear near the soil line on the surface of roots and stems of older plants. Canker development may kill the plant's growing tip and weaken the stem, causing stems to break, separating roots from the rest of the plant when plants are removed from the field. Infection can move into the hypocotyl and root region, as well as primary leaf petioles. The plant taproot often becomes dark, necrotic, and devoid of lateral and fine roots. Management options in California are limited. 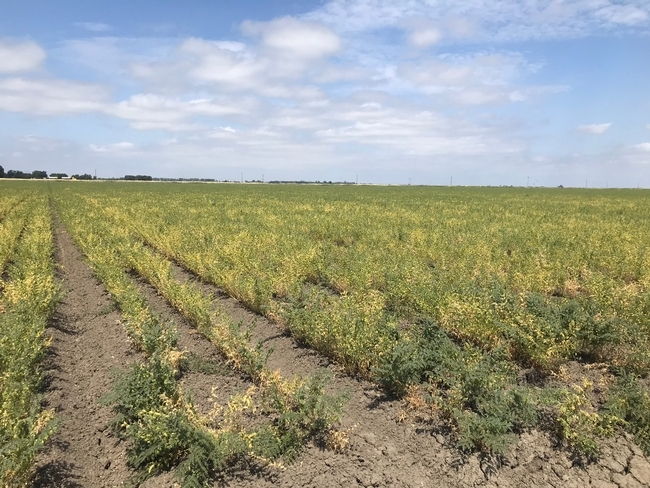 This disease affects other legumes like common beans, blackeyes, and limas, as well as other crops that may be grown in rotation (like sunflowers). Inoculum survives in both seeds and soil. A 3-year rotation with a cereal grain (except corn and sorghum, which are hosts) is recommended to reduce soil inoculum levels. The dry, warm weather in the winter months earlier this year were conducive to drought stress for garbanzos, which increased the risk of disease. If possible, irrigate to avoid drought stress conditions. Garbanzos grown in soils that are high in organic matter tend to have more problems with this disease, however, garbanzos in other soil conditions are at risk if the plants are stressed and the environment is conducive to disease development. The Diseases and Abiotic Disorders section of the UC IPM Pest Management Guidelines for Dry Beans have been recently revised and updated and are now available online at UC IPM Dry Beans Pest Management Guidelines. Authors include Farm Advisors Carol Frate (emeritus) and Rachael Long and UC Davis Professor Paul Gepts. Two new diseases were added, including pythium in established plants and chocolate blotch on limas. The Fusarium wilt sections were also consolidated and new photos were added throughout the guidelines. This includes an updated photo page to compare common diseases and abiotic symptoms to help identify them (Photo Identification). With the upcoming planting season for dry beans, these guidelines can help with managing diseases in your fields. Worried about southern blight? Yes, beans are susceptible and you'll need to rotate to a non-host crop, including corn or grains for at least 2-years to reduce the inoculum. How about alfalfa mosaic virus? This disease is transmitted by aphids from alfalfa fields, so avoid planting beans adjacent to alfalfa. This information and much more are available through the revised UC IPM Dry Bean guidelines! The remaining pest management sections, including insect pest and weed management, are in the process of being revised and will be published soon! 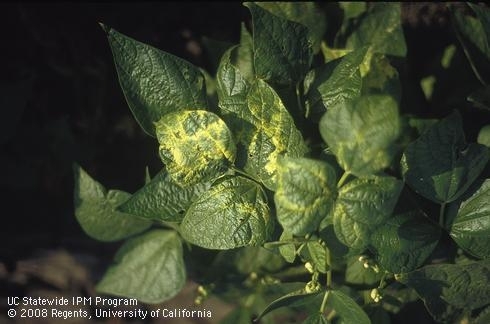 A dry bean plant with yellow-mottled leaves from alfalfa mosaic virus, vectored by aphids. Avoid planting beans adjacent to alfalfa fields.